A resource for anyone who has a presentation to give but does not have time to prepare or feels anxiety about not having anything to say. The 101 Ready-to-Use Presentations and the premade PowerPoint presentation slides will greatly facilitate any presentation that needs to be given. 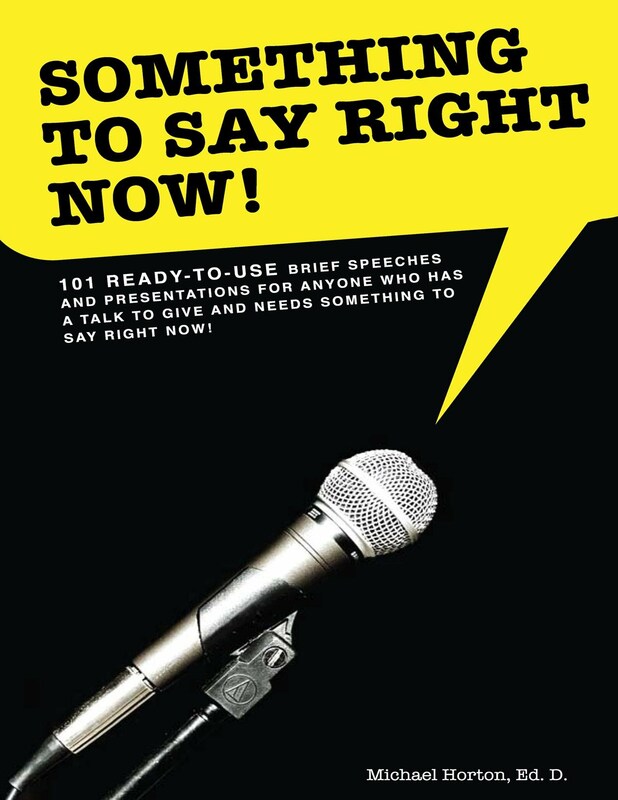 Something to say Right Now, 101 Ready-to-Use Presentations, by Michael Horton, Ed. D. provides users with a vast variety of topics which the speaker can tailor to meet the needs and interests of his or her audience. The 101 presentations are also available as stunning premade PowerPoint presentations. 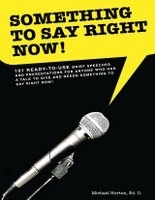 Each presentation is ready-to-use providing the speaker with something to say right now. The speaker is supplied with a title, introduction, body, and conclusion to the presentation as well as key concepts to take away. In addition, the speaker is provided with suggested discussion questions and learning applications to greatly improve the value of the presentation for the audience. Topics such as, Customer Satisfaction, Dealing with Problems and failures, and Improving Communication organized in an easy to follow format that will help ease the speaker’s mind, while providing an excellent format for those listening to the presentation to understand and benefit from the topic. Michael Horton’s Something to Say Right Now will help the speaker feel confident about the presentation, and also give the appearance that the speaker went through a long preparation process. About the Author Michael Horton, Ed. D. is an entrepreneurial consultant, writer, and life coach. He teaches graduate psychology for Walden University and undergraduate psychology for University of Phoenix. Dr. Horton is an experienced speaker as a teacher, workshop facilitator, and keynote. He has earned the status of Advanced Toastmaster Gold through Toastmasters International. Michael Horton has published six e-books, all available at www.hortonadvantedge.com. Works great on eBook readers like the HOT new eBook reader "Kindle" by Amazon which downloads eBooks, Newspapers, etc. anywhere wirelessly, with no monthly connection fee! (Store over 200 books and more in the palm of your hand!) SAVE TREES!!! Buy a Kindle now, just click below!!! Kindle Version (requires $300 Kindle)Select this one below ONLY if you already own a wireless Amazon Kindle device!! !